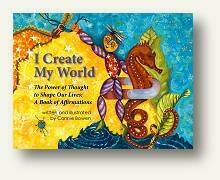 “I Create My World” is a beautiful book of affirmations by Connie Bowen for ages 6 and up – and for the child in us all. The book empowers the reader, encouraging her to create their own affirmations and illustrations. 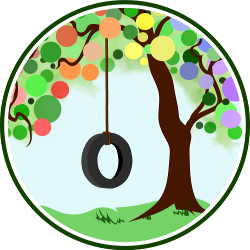 This is a joint giveaway with Going A-Musing and Natural Parents Network. You may enter at one site only. Please find the section marked “Win it!” for the mandatory entry and optional bonus entries. Connie Bowen is offering our readers a giveaway of three copies of her Kindle book “I Create My World,” a value of $20.97. This Kindle book is a beautiful set of affirmations for ages 6 and up – and for the child in us all. Written and illustrated by Connie Bowen, “I Create My World; the Power of Thought to Shape Our Lives: A Book of Affirmations” is a beautiful book of affirmations that gently nudges us to use the power of thought to shape our lives. As someone familiar with the Law Of Attraction, I found myself nodding in agreement as I turned the pages. Connie reaffirms that we hold the key to our destiny and can attract the outcomes we want, leading to a life of fulfillment. The book encourages the reader to have faith in herself, urging her to acknowledge her unique talent. Reading the affirmations brought on a sense of serenity. As soon as I downloaded the book I feasted my eyes on the brightly colored visuals and couldn’t wait to ask my 15-year-old son to join me and enjoy it together. My son is a talented artist and has been sketching from the age of three, and I knew he would love this. He did. I had the privilege of studying in a school where we had a “values” class where we would listen to inspiring stories with a moral. We were also encouraged to narrate real life incidents and describe what we learned from them. Connie’s book is a lovely way to teach children to recognize their own strength while cultivating their sense of self-esteem, making them feel worthy. Doing this at an early age can mold a child’s belief system, steering them along the path to positivity. I grew up believing in the power of positive thought, and reading this 38 page book packed with imaginative and cheerful paintings was a treat. The affirmations accompanying each painting are just the sort I would use to create posters and put them up in the most visible spots for ongoing inspiration. Everything about the book exudes a positive feeling. I painted the collection of whimsical paintings that comprise I Create My World, each with their own characters and interesting story, for a child to interpret using their unlimited imagination. I enjoyed making them, and it was fun and challenging thinking up new and interesting images. After I had collected quite a few, I put them safely under my desk and moved on to other creative pursuits. Fast forward years later when I was working with affirmations and theories of the law of attraction. One day, on my early morning walk, I had been repeating affirmations while concentrating on picturing the life I wanted to create. Soon after, I was enjoying the warm water of my morning shower when into my mind popped the words “The paintings under your desk go with those affirmations.” I had not been thinking about those paintings, and they would still be under my desk to this day, except for those words. The ebook “I Create My World” is the final result of pairing those paintings with affirmations that encapsulate what I’ve learned in my spiritual studies. Connie recommends encouraging children to let their imagination run free as they enjoy each illustration in the book. Coming up with their own affirmation based on their interpretation of the image can be fun. The next step is to let them create their own affirmations and illustrations and displaying them around the home! 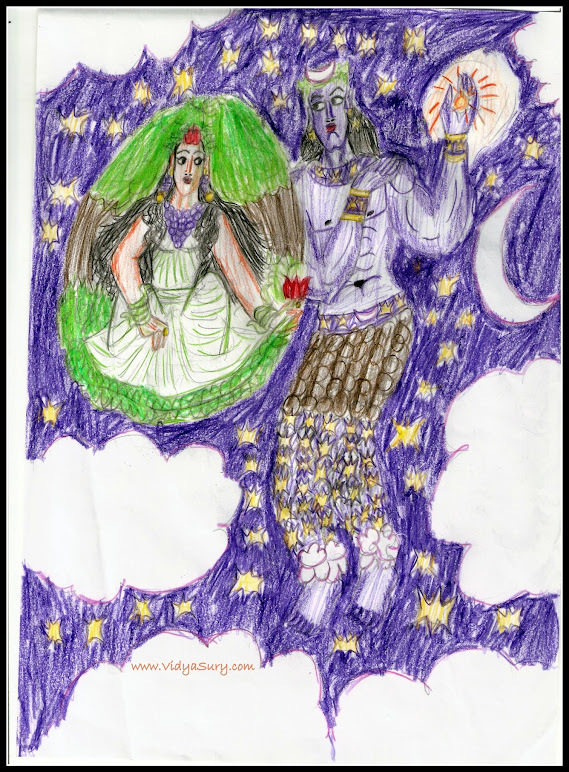 To the right is something my son created – he is writing a story around it! Connie’s first book “I Believe In Me” was listed in Huffington Post’s 50 Inspiring Children’s Books with a Positive Message. I recommend this book – and hope that the author will introduce a print version. Connie began drawing at an early age, majoring in art at Washington State University. 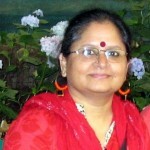 She is the author of the endearing Unity classic I Believe In Me, winner of the National Athena award for book-as-mentor in the category of spirituality. I Believe In Me was recently listed in Huffington Post’s 50 Inspiring Children’s Books With a Positive Message. Connie lives with her family in Portland, Oregon. Visit her at www.conniebowen.com. You can purchase your own copy of I Create My World at Connie Bowen’s website . Each copy is $ 6.99 and can be downloaded via iTunes store for iPad, iPhone or iPod touch, via Amazon in Kindle Store or via Barnes & Noble for the Nook. For your own chance to win a copy of I Create My World by Connie Bowen , enter by leaving a comment and using our Rafflecopter system below. The winner will receive 3 copies of the Kindle ebook I Create My World. Contest is open WORLDWIDE. MANDATORY ENTRY: Visit Connie Bowen and tell us one thing you have learned about her! You must enter your name and email address in the Rafflecopter entry system for your entry to count, after leaving a comment on this blog post. Leave a valid email address so we can contact you if you win. Email addresses in Rafflecopter are not made publicly visible. Please leave the same valid email address in your mandatory comment so we can verify entries. This is a joint giveaway with Going A-Musing and Natural Parents Network. You may enter at one site only, and we’ll be recording IP addresses to ensure that there are no duplicate entries. That said, please do visit and enjoy both sites! BONUS ENTRIES: See the Rafflecopter entry system for bonus entries to increase your chance of winning after completing the mandatory entry. All bonus entries are entered directly into Rafflecopter. Give it a try, and email or leave a comment if you have any questions! Contest closes December 22 at 11:59 p.m. Eastern Time.